Thrust of Sorrows takes the form of a roughly 12-15’ trebuchet. Historically, this medieval weapon was used for both offense and defense in war. We would like to bring to BRAC and the Bronx community a form of aggressive peace of mind. 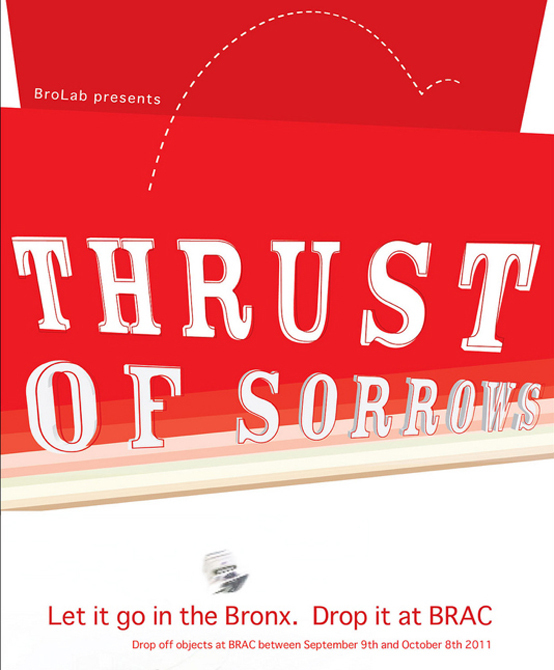 BroLab would like to give locals and visitors to the Shifting Communities exhibition series a chance to unburden themselves of their personal symbols of broken dreams, heartache and failure. Artifacts can range from the small trinket to furniture or appliances. We want to genuinely help the spectator and welcome them into our work –anyone can help define it and in part, complete it. It is our hope that anyone looking to launch will desire to part with personal affects as a way of cathartic release. BroLab would assume responsibility for the appropriateness of projectiles inasmuch as culling suitable non-environmentally threatening artifacts. Our trebuchet can be modified to propel objects in a variety of distances ranging from 20 to 100 yards. This allows for greater flexibility with regard to available sites and general containment of the anticipated array projectiles. BroLab will document this event with video and targeted photography mapping our collected artifacts journeys from origins to their definitive sites of impact. We want our trebuchet to lighten ones’ load and work to encourage participation. Originally meeting in the Bronx Museum’s Artist in the Marketplace program (AIM 29), BroLab grew out of a series of studio visits and that subsequently evolved into a collaborative group. At our core, we want to see what we can create when we put our collective minds together. BroLab has an ad-hoc operating structure and encourages each of its members to maintain their individual practice. Our goal is to create exciting contemporary and experimental art for a wide range of venues and forums as well as generate opportunities for artists everywhere.